Deer Ridge Correctional Institution is a medium/minimum security prison located in Madras Oregon. It houses up to 774 minimum security inmates and 1,228 medium security offenders in separate buildings. 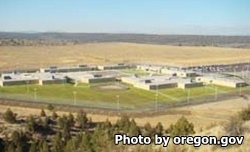 Construction of Deer Ridge Correctional Institution was completed in 2008 making it the newest prison in the state. Inmates at Deer Ridge Correctional Institution are encouraged to participate in education programs that give the inmate the ability to earn a GED. Additionally, offenders can receive mental health and substance abuse treatment. Work programs at this facility employ inmates in supportive positions within the institution and also allows them to work for various county and state agencies providing a supervised labor force. Visiting at Deer Ridge Correctional Institution occurs on Fridays from 7pm-9pm and on Saturdays, Sundays and Holidays from 7:15am-10:15am and from 1pm-4pm. This facility runs a program called the 'Visiting Room Homework Program' on Saturdays from 1pm-4pm. The visiting room homework program allows the children of inmates to bring homework assignments to visitation to complete with their fathers. For more information on the visiting room homework program contact the facility.